The study of dynamic fracture has been a key component of material testing, especially airplanes, boats, and other vessels for which unstable cracks can be detrimental. We have studied two new features of the rupture of rubber. First, we carefully followed ruptures as they make a transition from subsonic to supersonic speeds. 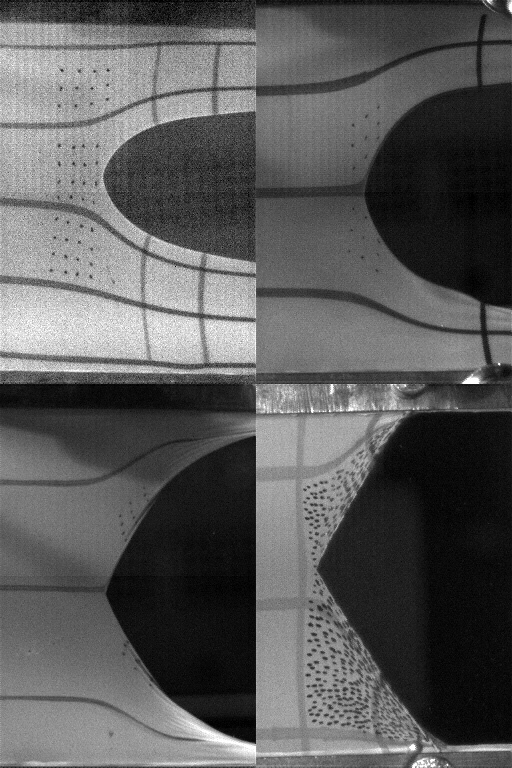 Second, we found that when rubber is stretched past a critical amount, ruptures stop propagating at all. This unexpected phenomenon is probably due to formation of crystals within the rubber. 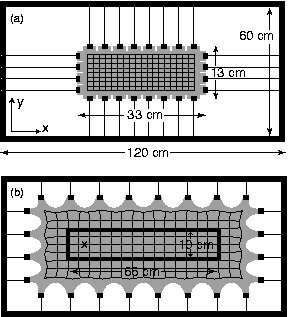 Using natural latex rubber sheets of thickness 0.15 mm purchased from McMaster-Carr, we studied rupture speed in samples gripped rigidly in the x direction and stretched along y (stretch ratios ?x=1 and 1.5 < ?y < 4.7). After stretching the rubber to the desired extension, it is clamped between two steel rectangular frames. A crack is initiated with a razor blade and the velocity is determined photographically. The crack speed and shape depend on ?y. Classical fracture theory holds that all crack tips must locally resemble a parabola, but it is clear that rubber cracks form a sharp cusp at high stretch ratios. The crack is initiated with a razor blade as in the dynamic fracture experiment, but the crack will stop abruptly for ?y greater than about 4.5. This phenomenon persists over very long times; there is no visible difference in the crack when left for hours. The crack can be widened by slowly cutting the rubber at the tip of the crack with a razor blade; this typically does not cause the crack to become unstable. 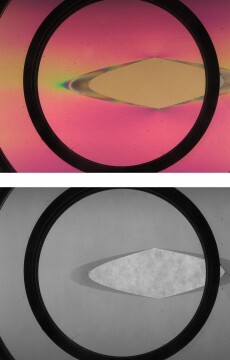 When viewed through a circular polarizer, the rubber exhibits photoelasticity, an effect of polymer strands aligning with the direction of stretch, forming an anisotropic material. X-ray diffraction studies show the formation of crystallites at room temperature about 20 nm long almost perfectly aligned with the direction of stretch. The degree of crystallinity increases with stretch ratio. The plot of crack speed vs. ?y shows this effect: the crack speed decreases very rapidly for ?y greater than about 4 and the crack does not propagate for ?y greater than about 4.5.